B K Nault's fiction ranges from the sweet to the sublime. Character driven, high action, they at once amuse and satisfy readers seeking adventure. The Kaleidoscope raises many questions about how the universe operates, and how we'd each react if given the opportunity to change one thing about the future. Nault has written a platform for asking these questions in a high concept adventure story that straddles many genres with skill and finesse of a seasoned writer. The Kaleidoscope is a work of suspense and intrigue by author BK Nault. Mixing genres between speculative and science fiction, the plot centers on the kaleidoscope of the book’s title, a powerful device which is able to produce life-altering visions of the future when any human being looks through it. Whilst the device itself seems to be an exciting new form of enlightenment, it is inevitable that there will be certain parties in the world who’d like to use it to achieve their own sinister ends. This is where our anti-hero, the hermit-like Harold Donaldson, realises that in order to save the human race, he might actually have to truly become part of it for the first time in his life. Multi-genre fiction has always been a favourite of mine to review, and BK Nault did not disappoint me with this excellent feat of storytelling. Social ineptness, wariness about the future, and the most basic of human fears underlie every delicately crafted element of The Kaleidoscope’s plot, turning what could have been a rather interesting sci-fi story into a richly human and character-driven novel. Nault’s prose is full of vivid description and delightful wordplay, and her formation of an unlikely hero in Harold Donaldson is witty, bittersweet, and thoroughly endearing. I feel that even readers who dislike speculative fiction will be hard-pressed not to enjoy the realism and credibility of this tale. 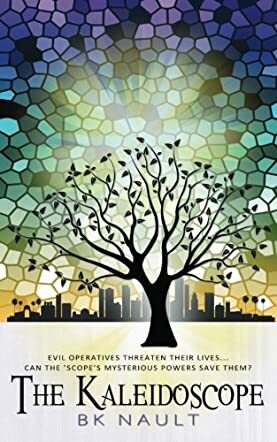 Overall, I’d highly recommend The Kaleidoscope to readers who are looking for a unique and highly accomplished new read. In B.K. Nault’s The Kaleidoscope, Harold is not your average computer forensics expert. A troubled past has made him shy, but that does not mean he is not looking for adventure. When he's given the opportunity to get hold of some very amazing technology, he jumps at the opportunity; however, he has no idea that this opportunity is going to change his life. The Kaleidoscope can change the future of the viewer and if it falls into the hands of the wrong person, things can go really bad in a very short time. The despicable plans of the evil one must be stopped, but for that, Harold accepts the help of some surprise friends. These quirky people include a breast cancer survivor, a mail room guy, and a gay couple. Although all of them have their own secrets and problems, it is Harold who must dispel his past and move forward to save the day. In The Kaleidoscope by B.K. Nault, I found the perfect combination of mystery, science fiction, romance and, of course, action. There are not many novels that have the ability to nail all these genres and for some reason B.K. Nault perfectly perfected it. Every character is a survivor in a sense, and I really enjoyed that. Pepper and Harold have a sweet romance. They are partners and their love story does not overpower the mystery. Also, I really appreciated the fact that all the main characters of the novel were given equal page space. The plus point for the reader: Harold comes from a really traumatic past, but that does not make him a tormented soul and this is very refreshing. The Kaleidoscope by B.K. Nault was a breathtaking read. I couldn’t put it down despite great weather this Memorial Day weekend. Several storylines weave through each other seamlessly as Harold and Pepper, Morrie and Walter, and a priest, dance around each other’s agendas with plenty of suspense thrown in. What is the kaleidoscope and why are people willing to kill to get it? Who is on Harold’s side and who is secretly working against him? How will it end, and will Pepper get a clean bill of health from the oncology specialist? You will love reading The Kaleidoscope, a Christian novel. Not judgmental or heavy handed on the theology, The Kaleidoscope sends a Christian invitational message to accept or not, which fits well with the story. B.K. Nault is an experienced author of both fiction and non-fiction. I especially enjoyed reading The Kaleidoscope because it contained so many elements that I enjoy. The characters are engaging and likeable, the storyline is believable and flows well, and there is something a bit mystical in the kaleidoscope itself that will intrigue younger and older readers alike. The main character, Harold, who throughout the book referenced a leadership book he was reading in hopes of spurring his personal growth, did experience a type of healing and a personal transformation which changed his life forever and will provide hope to readers who may have experienced tragedies of the same magnitude. This would be a fun beach or vacation read this summer and it will not disappoint.